Large steel stacks and chimneys present unique design challenges to engineers. Given their size, the rules typically used for other structural elements are not necessarily applicable and can potentially result in either uneconomical or unsafe designs. Currently there is no dedicated code to the design of steel stacks in Australia, so one must look elsewhere for guidance. 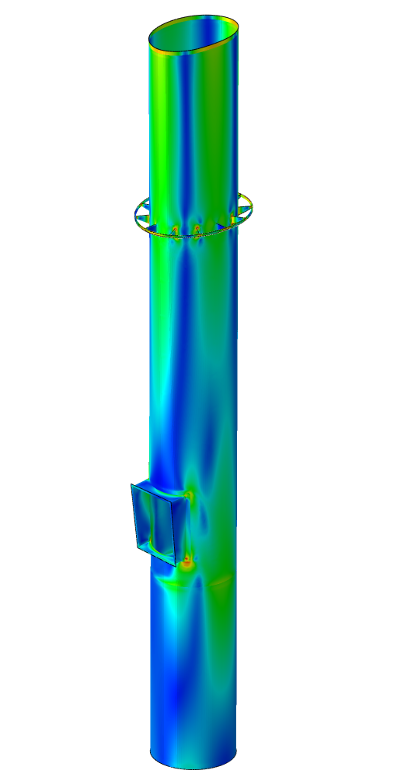 This article discusses a number of alternative design codes that FE Consultants regularly employ to ensure safe and economical steel stack designs. The two most commonly used codes are CICIND – Model Code for Steel Chimneys and ASME STS-1-2011 – Steel Stacks. Both codes present methods to calculate the strength of the stack shell that is unique to other steel structures. Importantly, both codes present different methods of calculating the wind load on the stack. In this regard, the engineer must make a judgement on whether these wind loads should be substituted with those calculated by the Australian wind code: AS1170.2. When making this judgement it is important to recognise the differences in the methods used by all three codes to calculate the loads. In addition, it is important to recognise at which point in the analysis the stresses generated by these loads are compared against the code allowable stresses. A major difference is the selection of the annual recurrence interval (ARI). Both CICIND and ASME STS-1-2011 use a 50 year annual recurrence interval as the basis for the calculation. In CICIND the stresses generated by the 50 year ARI wind load are factored up to account for the potential that this wind load will be exceeded. This is explicitly outlined in the commentary for the code and effectively increases the ARI. For tropical storm regions and non-critical chimneys the ARI is effectively increased to 300 years for wind region C and 225 years for wind region D. This should be compared against the desired ARI required based on the structure’s importance level. In ASME STS-1-2011 there is no explicit mention of the potential for the 50 year ARI wind load to be exceeded. With that said, the allowable stress includes a safety factor of 1.5, which mirrors the CICIND factor for increasing stresses in tropical storm regions so the designer must be careful comparing any wind load generated using AS1170.2 directly with CICIND and ASME STS-1-2011 allowable stresses as neither have been developed using typical Australian Standard ARI’s. Further, when supplying the expected base over-turning moment due to wind loads for the civil/structural designer it must be clearly communicated on which basis the loads have been calculated. The other point to note is that the wind load predicted by each code is dependent on the inherent damping of the structure, which, in the case of aerodynamic damping, is dependent on the wind velocity. 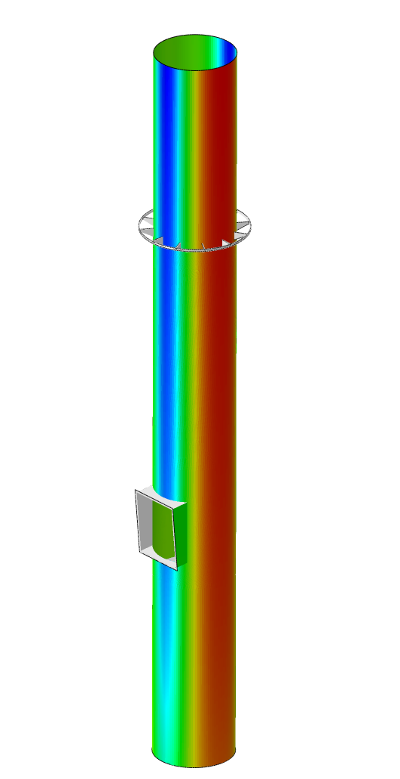 Hence, to directly compare wind loads generated on the stack, the same input velocity must be used so that the same damping is applied. AS1170.2 contains region specific data to characterise wind loads, in particular the terrain height multiplier. CICND uses a common exponent to describe the variation of wind speed with height. CICIND explicitly explains the derivation of the design factor for stresses generated by wind loads. Therefore, the designer can confidently manipulate this factor to account for different ARI’s. CICIND is a limit states design code, which is considered more appropriate for large stacks given that second order effects are often significant. In summary, the strength assessment for each design code has been developed specifically for use with the method provided to calculate wind loads. Hence, using wind loads calculated via AS1170.2 directly with the design codes can prove to be troublesome unless the inputs are carefully selected. Please contact FE Consultants if you require additional information or assistance with the design of large steel stacks or chimneys.